If you have an iPhone or iPad with the third party YouTube app installed, you may notice that when you click to open a YouTube link from Safari or elsewhere, you’ll discover he YouTube app opens to watch the video. This happens even if you want to watch the YouTube video on the YouTube website in Safari for iOS. There are a few workarounds to this situation, each of which will allow you to stay on the YouTube website in Safari, so if you’re annoyed with the YouTube app launching (or trying to open the page in the app) when watching YouTube videos from an iOS device, read on to learn your options. Just tap “Cancel”, then tap into the URL bar of Safari and hit the Go / Return button again. This should cause YouTube to stay within Safari and view the video. 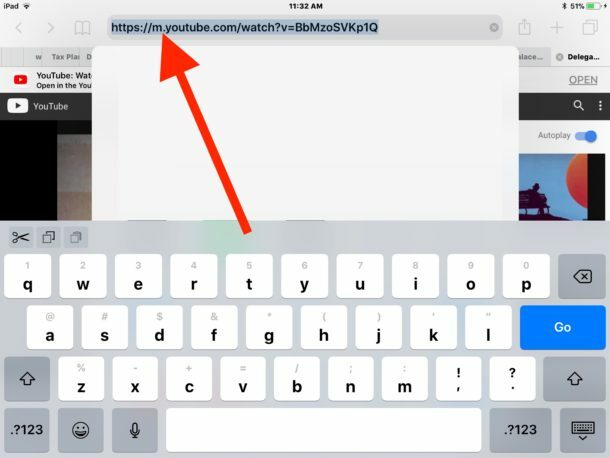 The next option is to modify the URL of the YouTube video you want to watch in Safari on iOS. This is a bit radical, but if you’re frustrated by Safari constantly redirecting YouTube links to the YouTube app in iOS and can’t deal with the prior workarounds, then simply deleting the YouTube app from iOS is a solution as well. 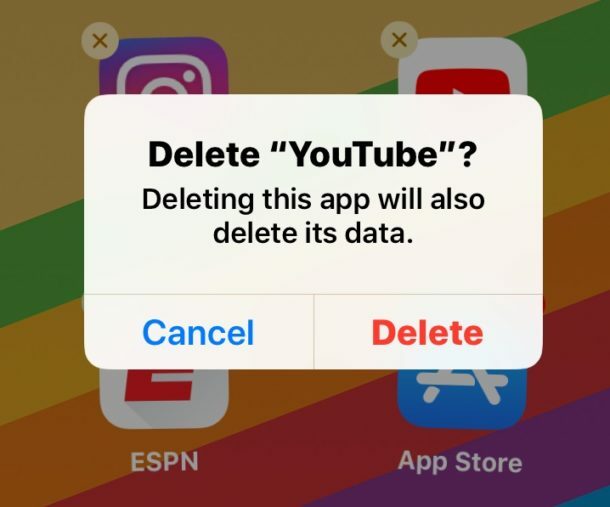 By uninstalling the app from iOS, YouTube videos will always load in Safari, since there will no longer be a YouTube app installed to launch on the iPhone or iPad. By the way, if you’re using a much older version of iOS you can rely on the Restrictions trick outlined here for similar effect, but it’s basically the same effect as deleting the app in modern iOS releases. Do you know of any other workarounds, solutions, or tricks to handle YouTube links in iOS? Let us know in the comments! 3. Tap on the link to the youtube video. It will now load within safari instead of attemting to launch the app (and it will load using the m.youtube.com mobile website). Glad to see this tip. Unfortunately option 1 doesn’t work for me (and probably for many others) because I never get the “open this page in youtube” prompt. Instead, the youtube app immediately opens without asking when I tap on a link to a youtube video. Therefore, the only workaround I found was to tap on the sharing button and then on ‘request desktop site’ before I tap on the link. That way the video loads up in Safari instead of loading the youtube app. 1. Open Safari (or other browser) and load the page with the youtube link. 3. Once the page finishes loading, tap on the youtube link. It will now open within safari as opposed to launching the app. It’s not just YouTube. Many companies harass you endlessly to download their app. In some cases the app is quite good and you may prefer it. In other cases (Instagram comes to mind) it’s useless. Meant for a phone and not much effort even for phone version. I use the hand over quite a bit but I find it unpredictable. At times, I have app installed but it takes me to the App store anyway. Other times it will ask about opening the App. It’s flaky. I can’t figure out a pattern. Generally entering the URL will permit you stay on Safari. Yeah but most others still give you the option to use the website instead of launching the app. Youtube doesn’t. If you have their app installed, it will automatically launch without even asking when you tap on a link to a video while browsing the net. The only workaround to this is requesting the desktop site before you tap on that link. Then it will open within Safari. I haven’t had the YouTube app on any of my devices since it became possible to delete it … haven’t missed it one bit … and I watch a ton of videos on YouTube. I just do it in Safari. Works great. Why would you want to not use the app. I can’t see the point in using the website?? Well if you are specifically going to watch a video, I agree with you. However if you are browsing a website and run into a link to a youtube video, it is indeed a bit annoying to have to leave the browser just to see the video. In any case, in addition to the methods described above the automatic launch of the youtube app may be avoided by using the ‘request desktop site’ feature in Safari to load the desktop version of the website before tapping on the link. I wish there was a way to prevent links from being opened in Mobile Safari automatically when tapped. Is it too much to ask for Apple to finally give iOS users control over default handlers? There are uses who prefer to use alternatives to Apple’s apps/clients. I have the opposite problem. When I tap a link it opens the video in the browser. At the top I get the option to to app. But when I do, it takes me instead to the App Store. When I tap Open from there I don’t get the video. Yet others have the YouTube app open automatically. How do I set it up some that it automatically goes to the app? You must download and install the YouTube app for iOS to open the links into YouTube app. It’s opening App Store so you can download YouTube. « Feeling Nostalgic? Run WinAmp in a Web Browser & Play MP3s!